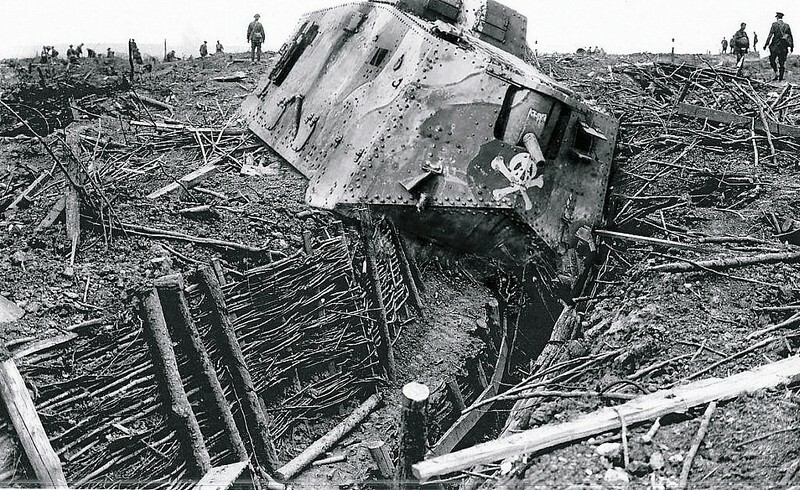 German A7V disabled by trench. Apparently captured by New Zealand forces in the Iwuy area during the action of October 11, 1918. Iwuy is a small commune in France, South East of Vimy and North East of Cambria. On October 11, 1918 the 18th Battalion was involved in an operation where they were able to repulse 3 German tanks. This action has the significance of being the last action in World War 1 were the Germans used the A7V tank. The German Army had adapted their interpretation the British innovation of the tank into the large, lumbering A7V. This 11 foot high. 33 tonne tank carried a crew of 18 with 6 machine guns and 1 5.7 cm cannon were built in very small numbers and saw limited tactical use. Given their size; lack of hardened armour plate; lack of maneuverability their utilization in the battlefield generally was not very successful. It was during this action that Captain William James Baxter earned the Military Cross. This précis of the actions of that day encapsulate a significant historical military action in regard to the use of the innovative weapon system – the tank. 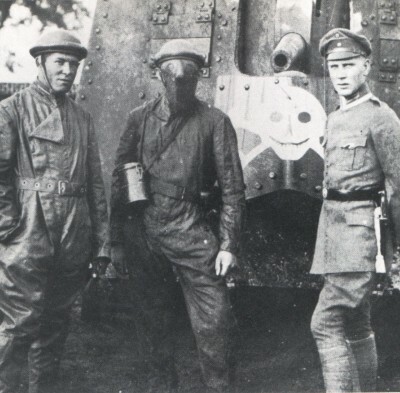 This was the last action in which the German A7V tanks were used. From this War Diary entry it is apparent the German tanks caused initial havoc with the British and Canadian action. The 20th and 21st Battalions swung too far to the left, the reason is not stated in the 18th Battalion’s War Diary but it appears that the German tanks, which most probably were not supported by German infantry troops, had an opportunity to cut off these two battalions from their line of communication, resupply and retreat. 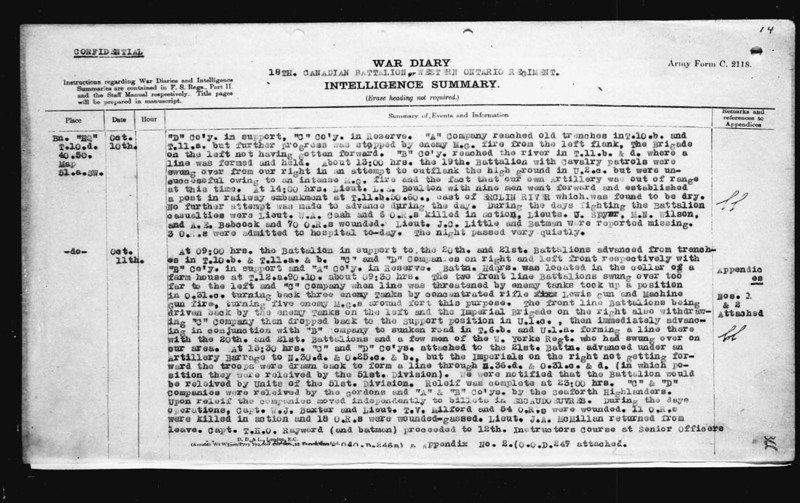 It is not clear to which Company the War Diary refers to as there is some confusion between the text of the War Diary and that of the Military Cross citation. The War Diary states that “B” Company was in support but the War Diary states the “C” Company was in action against the tanks. Given the brevity of the War Diary entry the confusion could be cleared up by the fact the 18th Battalion was in “support” of the 20th and 21st Battalion’s counter-attack at Iwuy so any action by the 18th was in “support” of the counter-attack. The earlier War Diary reference was specific to the actions of the 18th Battalion and not the larger action of the counter-attack. It is not helpful that the War Diary entry is covering such a long and complex action. 20th Battalion Disposition on 11/11/18. Reference the German map below. The 21st Battalion probably attacked almost due north and the German tanks pushed around the south of Iwuy heading East in an attempt to cut off the Battalion. Not the ‘T” road intersecting just North of the Battalion and reference that to the map below. The 18th Battalion was, most likely, to the south of the 21st. German source showing the action of the A7V tanks on October 11, 1918. 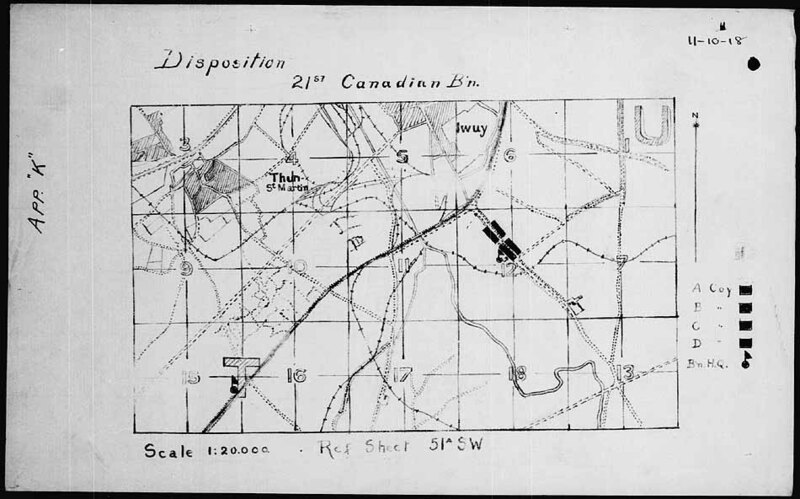 From the map above the “T” intersection of the roads just South of Iwuy comply with the 21st Battalion’s disposition map. Attack starts at 9:00 AM local time by 20th and 21st Battalion with 18th Battalion in support. Battalion Headquarters moved at 9:30 AM into a farm cellar, probably to be closer to the fighting. 20th and 21st Battalion move too far left allowing German tanks (and most probably supporting infantry) an opportunity to cut them off. Where rifle grenades as part of the effort to repulse the tanks? Was the nature of the terrain the German tanks had to cross part of their decision to retire? What effect did the mechanical condition of the tanks have to their tactical withdrawal? The capture of the 5 German machine guns bears some explanation. Since this was a counter-attack these weapons may have been left in the German lines after the 20th and 21st Battalions over-ran German positions or they were captured by the 18th Whatever the case, their capture appears to be so sudden that the German soldiers could not carry these weapons away or had time to disable them so they could not be used against them. The 20th and 21st Battalions, along with the Imperial Brigade make a tactical withdrawal to consolidate their lines and link up with the supporting battalions. “C” Company withdraws and links up with “B” Company and begins advance and reinforces the 20th and 21st Battalions in the advance line of attack. At 3:30 PM “C” and “D” Companies of the 18th Battalion are attached to reinforce the 21st Battalion and begin an advance under cover of an artillery barrage. This action, not being successful, the units retreat to await relief. The 51st Division relieves the 18th Battalion with the Gordons relieving “A” and “B” Companies and Seaforth Highlanders relieving “C” and “D” Companies. Relief is completed by 11:00 PM that evening. During the action Captain Baxter earned the Military Cross and was wounded. His wound appear to consist of a gunshot wound to the face and left wrist with was further complicated by foreign objects being lodge in his face near his eye socket. He also lost two upper incisors. For conspicuous gallantry and devotion to duty in front of Iwuy on 11th October, 1918, when in command of a support company. The enemy, having counter-attacked with tanks, brought our attack to a standstill. He pushed forward with his company, and having use of all his Lewis guns and three captured machine guns, was able to force the tanks to retire, thereby enabling the position to be held, and the advance to continue later. His courage and determination were worthy of high praise. Note that the citation records 3 German machine guns, which is at odds of the War Diary’s record of 5. It would be fascinating to have a German account of this action but given the terrain typically found in the front lines of these areas of action with the many shell holes, trenches, and other geographic features the effectiveness of the German AV7 tanks was limited in their maneuverability. This was most likely further compounded by the configuration of the armour these tanks being only able to withstand rifle and machine gun fire, which prevented them from having a decisive impact on the battle space. It also appears that the tanks were operating with limited or no German infantry support since the war diaries make no mention of German infantry involvement. Without coordinated infantry support the German tanks would have been exposed to Allied infantry attacks. The German military lagged in armoured doctrine in the First World War but would later take these lessons and develop new tactics for tank and infantry operations combined with air power which became the “Blitzkrieg” doctrine. It would be valuable to review the war diaries of the adjoining battalions to gain more insight into the action. Observe the image below in more detail. The spacing between the gun-shield of the main armament (5.7-cm Maxim-Nordenfelt) gun and the embrasure for this gun appears quite large. Perhaps concentrated fire from machine-guns allowed bullets to enter the tank with the resultant chaos of ricocheting projectiles inside the subject tanks caused them to be overcome. German A7V with captured British tank.